This first thing that I noticed (very horrified) when I installed Visual Studio and my MZ-Tools extension in the new MacBook Pro 13″ Retina that I purchased last month was that at 100% scaling (96 Dpi) everything looked very tiny and at 150% (144 Dpi) or 200% (192 Dpi) scaling MZ-Tools looked horrible with very wrong layouts. In some Visual Studio versions (such as VS 2008) it looked better. And since MZ-Tools also works with the VBA editor and VB6/VB5 I also tested with different results. At that point I became DPI-aware and read everything I found about Windows and DPI, which is a lot because it is quite complex and tricky. So, if you are not DPI-aware yet, I urge you to buy a retina external monitor or a retina laptop so that you can set at least 200% scaling (better than 150% scaling) to do some tests and fixes and avoid a painful experience. A “large” monitor such as the one of the iMac 27″, that I also own, doesn’t qualify if it is not the new retina model. In the future, especially with Visual Studio, two screens would be needed for better tests with “per-monitor DPI” awareness introduced by Windows 8.1 once Visual Studio supports it. WinForms scaling at large DPI settings – is it even possible? The same DPI is used in all the monitors of a computer (this is called “system DPI”). 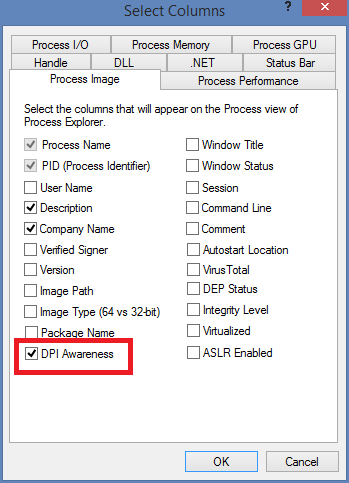 An application must declare through a manifest (embedded in the executable or in an .exe.manifest file, or even by code) its DPI-awareness. If an application lacks the manifest, or states that it is not DPI-aware, then the OS scales the application as a bitmap (something called “DPI virtualization”) while the application still thinking that is running at 100% scaling (96 dpi). Windows 8.1 introduced “per-monitor DPI”, where each monitor can have a different DPI and an application is notified of a change in the DPI when moved to another monitor, so that it can accommodate the new display. Given that your extension is hosted in an application (Visual Studio), you don’t have the chance of declaring anything about the DPI awareness of your extension, you are conditioned by the DPI-awareness of the Visual Studio version that is hosting your extension. Visual Studio 2005 and 2008 don’t state DPI-awareness in any manifest (embedded or otherwise) but sometimes are shown in Process Explorer as “Per-monitor aware”, for some reason that I haven’t found yet. Certainly they are not “Per-monitor DPI-aware” (not even “System DPI-aware”). Visual Studio 2010 and higher state “System DPI-awareness” through an embedded manifest (but not per-monitor DPI awareness on Windows 8.1). The bottom line is that since Visual Studio 2010 your extension must be at least “System DPI-aware” and even earlier for that issue with VS 2005/VS2008. Microsoft enhanced the DPI handling in VS 2013, and even more with high-resolution icons in VS 2015. Once the form or toolwindow is scaled, the layout of controls must be correct, that is, without overlapping controls or clipping out of boundaries. In practice, you can compromise providing just 16×16 and 32×32 resolutions and stretch images for resolutions that you don’t provide. Now, how to provide DPI-awareness in your extension depends on the technology that you are using: it is said that it is easier with Windows Presentation Foundation (WPF) but if you created your extension back in VS 2005 chances are that you are still using Windows Forms. The good news is that you can achieve excellent DPI-awareness with Windows Forms, even with .NET Framework 2.0. I say this because in newer versions of .NET Framework (since 4.5) a Windows Forms app can opt-in for better DPI handling. You may need to scale some controls at run-time, depending on how they are added to the user interface. You may need to adjust at run-time some widths and heights, especially if you are using the SplitContainer control. You need to scale hard-coded dimensions in pixels that you may be using in your code for performing layouts at run time. You need to scale pictureboxes according to the actual DPI. You need to adjust the ItemHeight property of treeviews. You need to adjust the dimensions of toolstrip buttons with the ToolStrip.ImageScalingSize property. Avoid the use of the StateImageList property of the TreeView control, because in .NET Framework 4.0 or lower it’s always 16×16, and in .NET Framework 4.5 or higher the application can opt-in for a DPI-aware StateImageList, but your extension cannot. Instead you can use the Win32 API for TreeView controls to set the state imagelist and image index for nodes, as it was the case in .NET Framework 1.0 / 1.1, whose TreeView control lacked the StateImageList property. You need to adjust the width of the columns of the listviews because they are not adjusted automatically in high DPI scaling. I had already coded this (because I hate columns that don’t adjust automatically to the contents). The glyph of Radiobutton and Checkbox controls is scaled automatically if visual styles are enabled, as it happens with Visual Studio. 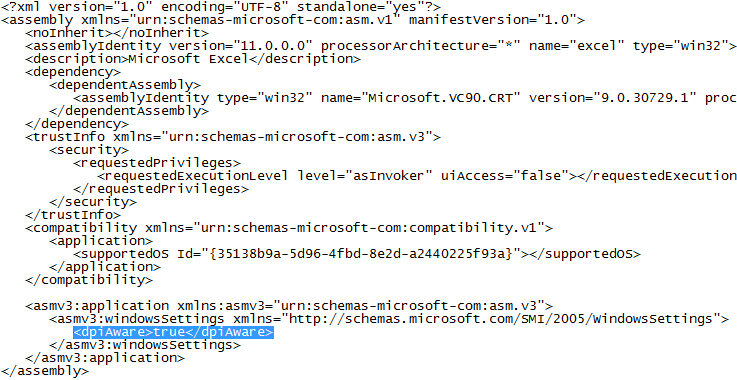 For some reason, in the VBA editor of Office they are not enabled so a call to the System.Windows.Forms.Application.EnableVisualStyles method is required. I am not sure, but AFAIK with “icon” style (not “photograph” style) and these low dimensions (say in the range 16×16 to 48×48) you get better quality providing native images at each resolution.